On the northern west side of Maui is Kapalua, most famous for its stunning ocean view golf courses. Filled with luxury resorts, it's a prime destination for those who know what they want when they come to Maui. By that I mean they either want golf or a top named resort. What they don't want are the more touristy parts of the island. First timers will find the location too far from the action but seasoned Maui visitors will love the secluded luxury that Kapalua has to offer. You can't do much better than The Ritz Carlton Kapalua, situated on Fleming beach, frequently named one of the best beaches in the world. Situated on 54 acres, the Ritz Carlton Kapalua Resort is everything you would image a Ritz to be and all the amenities you could possibly imagine. If the soft sand between your toes gets tiresome then head over to the full service spa or dive into one of the beautiful pools or partake in their many guest activities. There's plenty of natural beauty, hiking trails, two pristine golf courses and excellent snorkeling nearby. Of course, there are multiple dining options and no one leaves the Ritz without feeling pampered. Shuttles to nearby beaches and attractions if for some unlikely reason you want to leave this resort paradise. 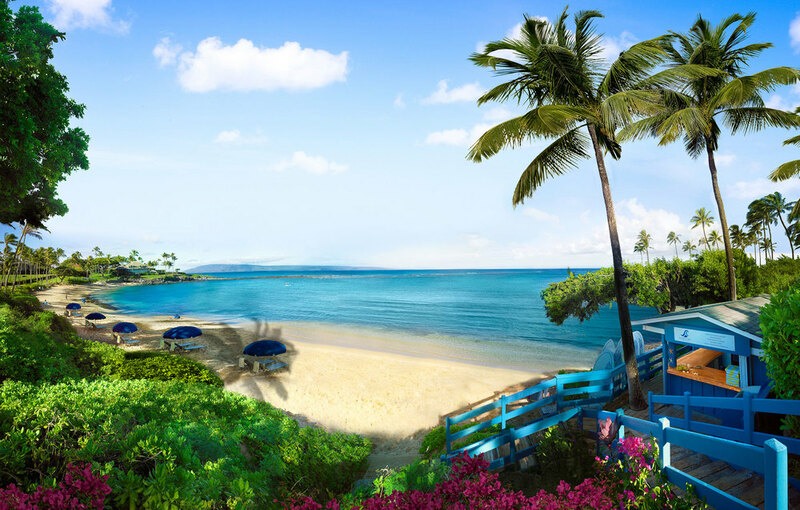 Montage Kapalua was once part of the beautiful Ritz Carlton but spun off on its own in 2014. The two ultra luxury resorts are often compared to each other and the quality of service and amenities are nearly identical. What sets Montage apart is the size of the rooms, from 1,250 to a whopping 4,000 square feet - to put this in perspective a standard large room is around 500 square feet. Of course with all of this space there's a full kitchen and huge lanai and just about every bell and whistle you can imagine. Their "Grand Residences" are like mini-mansions - insanely private and equally expensive. You know right now if you can afford it or not and if you can't there's nothing wrong with slumming it in a standard luxurious room. Killer three level pool that looks like it's spilling into the ocean and outstanding snorkeling right outside the resort. Everything top notch, including the two golf courses. Maybe giant mega-resorts and huge cement towers aren't what Maui is supposed to be all about. If that's your mindset than you'll love the Napili Kai Beach Resort, a down to earth condominium complex made up of low rise buildings and situated right on gorgeous Napili Bay. Their 163 rooms break out into a standard room all the way up to two bedroom suites complete with kitchenette. Best yet, there's no resort fee but you still get free wifi in the lobby, Kids eat Free in their restaurants, free BBQ and picnic areas, even free coffee in the morning and free coolers for the beach. Don't get me wrong, I love the giant resorts but there is something charming and very Hawaiian about the Napili Kai Beach Resort that makes it one of Maui's top picks. Do you really need a giant waterslide and a fake pirate ship filled with screaming kids when you have Napili Bay right outside your door? If you answered NO and just want a quality standard hotel in a location that is anything but standard then look no further. The Outrigger Napili Shores is a family friendly condo complex that gets you that Maui experience without busting the bank. The rooms are clean and comfortable enough, there's a restaurant onsite and a market nearby - good to know since there's a kitchenette in your room and gas grills outside. Get some steaks and lobster and forget about the expensive restaurants. OK, the folks at the Ritz are not jealous of you but I'm pretty sure that view of Molokai is the exact same one they're getting in their ultra expensive resort just down the way. Right on the bay, splurge for an ocean view and you'll soon forget that this was within your budget.